St. Augustinegrass (Stenotaphrum secundatum [Walter] Kuntze) is a common perennial warm-season turfgrass grown in Louisiana. St. Augustinegrass has a low tolerance for cold temperatures but is well-suited to warm, humid weather, making it a popular choice among homeowners. It also has greater shade tolerance among warm-season turfgrasses. St. Augustinegrass aggressively spreads through stolons (aboveground stems) and can be established via plugs or sod. 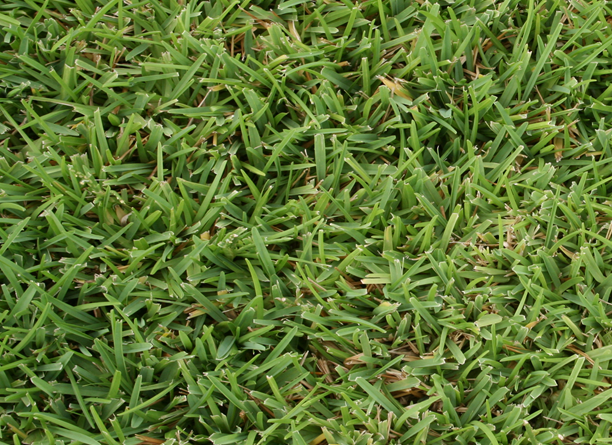 St. Augustinegrass is a dense, coarse-textured turfgrass with folded, medium-to-dark green leaves. Leaves are oppositely arranged on the stolon and have a wide, rounded tip. It has thick, singular seed heads, which extend slightly above the leaf blades and produce small, white-brownish flowers. St. Augustinegrass produces robust stolons (aboveground stems), which allows it to spread laterally. HINT: St. Augustinegrass can be confused with centipedegrass and carpetgrass. Note that St. Augustinegrass has wide, rounded, oppositely arranged leaves compared to the narrow, rounded, alternatively arranged leaves of centipedegrass and carpetgrass. Soil Type: Grows in various soil types that have moderate fertility and good drainage. Soil pH: Prefers soil that is very slightly acidic (< pH 7) to neutral (> pH 7), with soil pH ideally around 6.5. Always follow soil test recommendations to achieve desired soil pH. Light: St. Augustine grass performs best in full sun but can tolerate moderate shade. Growth Rate: Spreads quickly and vigorously via stolons. Mowing and Traffic: Mow at 2.5 to 3 inches routinely during the growing season. Never remove more than one-third of the leaf blade height at one mowing. Mowing St. Augustinegrass at the appropriate height is key in preventing scalping and reducing weed encroachment. Fertilization: Fertilize with up to 3 pounds of nitrogen per 1,000 square feet per year. Fertilizer should be applied from midspring to midsummer. Never apply more than 1 pound of nitrogen per 1,000 square feet per application. Nitrogen will result in faster St. Augustinegrass growth so applying lower nitrogen rates may be advisable. Follow soil recommendations for proper fertility. Establishing St. Augustinegrass in the lawn can be achieved via plugs or sod. Sodding is the most commonly used method for St. Augustinegrass establishment. No commercial St. Augustinegrass seed is currently available in Louisiana. Plugs: Purchase or create plugs from sod and plant each piece about 1 foot apart. Irrigate, fertilize and apply weed control as necessary until established.